Until recently, technology seemed to have enabled mankind to triumph over physical limitations, in effect abolishing time and space. Culture finally vanquished nature; we replaced reality — with the internet, video games and cell phones. While we who live in advanced countries can still appreciate human ingenuity, and the longer life spans and higher standards of living it has enabled, the fact remains that we are now and always have been a part of nature (which occasionally reminds us of that fact); and we are now clearly in a state of disharmony with the planet. Until the twentieth century, the natural world was seen as divine. In the mostly secular twenty-first century, we have (most of us) been liberated from the threat of eternal damnation, but not the spiritual vacuum fed by capitalist culture gone toxic. We are in need of some new form of sacralization of the world; we need to stop seeing nature as dead matter, only good if converted into money. 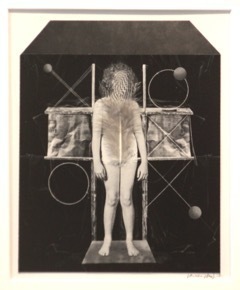 In her 1991 book, The Re-Enchantment of Art, Suzi Gablik writes: “I suspect we are at the end of something —a hypermasculinized modern culture whose social projects have become increasingly unecological and nonsustainable.” She quotes David Feinstein’s Personal Mythology: “we need new myths; we need them urgently and desperately.... Times are changing so fast that we cannot afford to stay set in our ways. 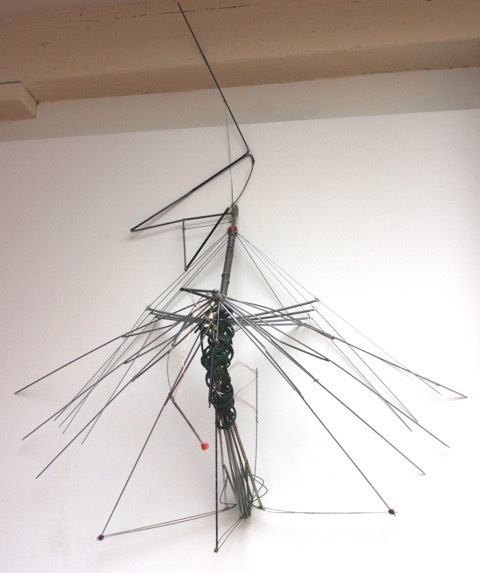 We need to become exquisitely skilled engineers of change in our mythologies.” She argues that artists and art have a role, even a duty, in changing society. Gablik: “The world has about forty years, according to ... the Worldwatch Institute, an independent Washington-based, environmental research group, to achieve an environmentally sustainable economy or descend into a long economic and physical decline.” Twenty-seven years later, much of the world has heeded the message, even if America is stuck in its blind faith in the invisible, omniscient hand of The Market. 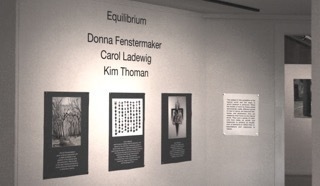 Equilibrium is a group show of three midcareer Bay Area painters—Donna Fenstermaker, Carol Ladewig and Kim Thoman—who explore a range of approaches and styles but share an interest in art’s traditional double nature: as a vehicle for both private aesthetic inquiry, and public enjoyment, edification and persuasion. 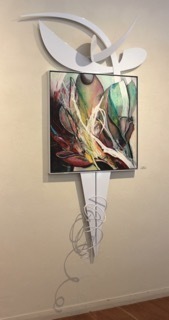 Installed in separate side galleries, except for one omnibus triple-threat front gallery, the works by these established midcareer Bay Area artists are beautiful objects that argue implicitly for more nature-consciousness and a wider perspective beyond the quarterly dividend. After a generation of art that focused on media culture—is ‘selfie art’ a fair description?—it’s a message that is timely and urgent. That dialogic struggle between observed fact and memory, along with the changes that inevitably occur during the creative process—due to the constraints of the medium, as well as happy accident—energizes the four oils on canvas and the dozen watercolors on paper shown here. Fenstermaker’s love of pattern and color comes across most clearly in her close-up views of foliage: the tall-format oils, Benicia Palms and Berkeley Bamboo; the single-page watercolors of floral mists: the red-orange Gingko, the deep salmon of Liquid Amber and Gingko, and the sprays of harmonized red, yellow and dark green of Rockridge BART. 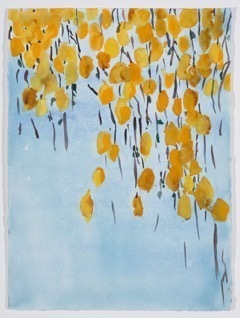 Sometimes the artist works in series, as with the three Birch (or Birches From Window) watercolors, in a Chinese-scroll vertical format, with the autumnal yellow leaves, seemingly threaded on pendant linear branches like beads or pearls on a necklace, set against a blue sky. Sometimes she works in a diptych format, with the two halves coalescing into one image, as in the watercolor Sleeping Trees, with its bare-branched forest, a pattern of dark cracks set against a soft, misty background of foliage and clouds; Davis Rainy Day, with its central sidewalk, receding into distance while reflecting the otherwise unseen moody sky, surrounded by yellow streetlamps atop spindly poles, like mechanical daffodils; and Sparkle, a diptych of deep blue bisected by a jagged yellow zip of a lightning strike crossed with an oscilloscope or seismograph recording, inspired by a car-window glimpse of sunlight striking San Pablo Bay: nature abstracted into near-mysticism. 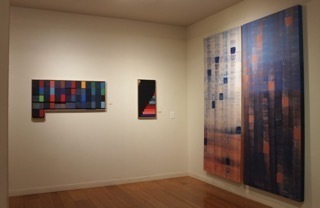 Ladewig’s interest in depicting “psychic space,” another difficult intangible, also fed into her breakthrough Year paintings of 2011 and 2012, two of which are shown here: 2012 Lunar Phases: Weeks 46-47 and 2012 Lunar Phases: Weeks 31, 32 & 33. 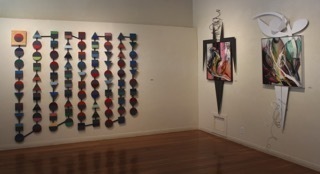 The vertical-format acrylic paintings, brightly colored horizontal bars arrayed atop a black background, resemble, superficially, the hard-edged color abstractions of Frank Stella or Kenneth Noland, but they encode the hours of darkness (black) and moonlight (colors, chosen arbitrarily, subjectively, based on “the day’s unique experiences, activities and moods”) during the November and August study intervals. 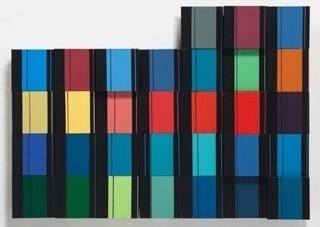 The later Year in Color paintings for August and September 2013 use the monthly calendar page format, with four or five registers of seven rectangular blocks, with August’s varicolored daily samples beginning on Friday and ending on Saturday, and September’s beginning on Sunday, ending on Monday. The painted blocks vary slightly in elevation, so that they appear syncopated, like player-piano keys, frozen by the camera: the music of time, encompassing the lunar and the terrestrial, is recorded in a kind of score. A larger piece, the striking Winter 2016: Year in Color, composed of some 90 separate squares, circles and triangles, all individually painted, and linked by a meandering (‘boustrephedonic’ in art-historianese) line, suggests a gameboard or flow chart of unknown purpose. Time Lapse, a two-panel painting in oil and resin on canvas, suggests a dialogue of opposites: white and blue for day and night,r espectively, with a matrix of squares on each, darkened or illuminated, like lighting arrays or keyboards, or videos, pixelated into abstraction. Shown here are four recent mixed-media pieces from Thoman’s They series of 2017, numbers 1, 2, 5 and 6, which feature square painted panels that serve as the torsos of Bauhaus-style geometrized human figures fabricated in painted steel. (The anthropomorphism here continues the human icon concept from Thoman’s earlier Gray Matters series, patterned on Crucifixion triptychs.) 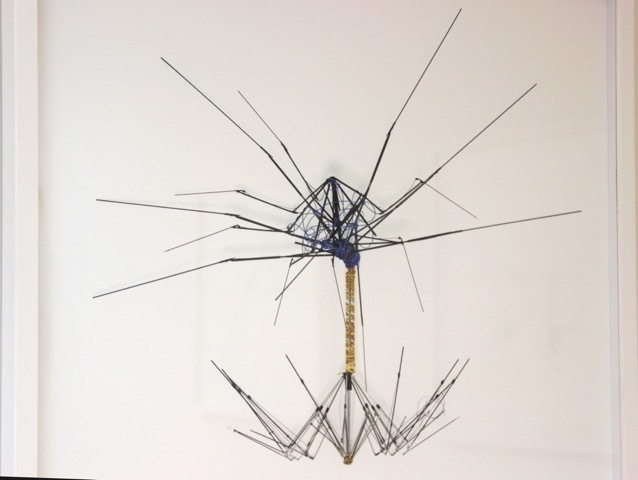 The limbs are sharply pointed triangles; the heads are coils of wire, or spoon-shaped metal projections. The sculptural and the painted elements are siimilar, suggesting vitality that is barely contained, or overflowing its banks. Each of these four androgynous personnages (to employ the Surrealist term for such ambiguous humanoid beings) stands alone, wall-mounted; yet all are related, sharing the same visual DNA. Also shown are three mixed-media Shortstop Tangle digital drawings, preparatory sketches for the They figures, which show the artist trying out different configurations and palettes. 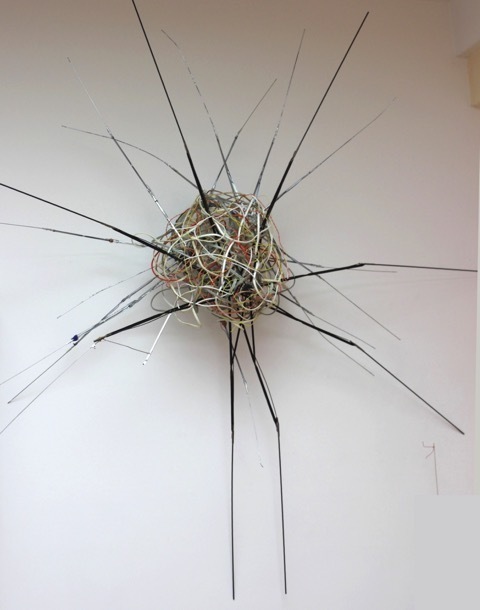 Our current political situation leads some of us in our exhaustion and dismay to see art as unworthy of our attention. While we need to stay informed and combative, we also need the aesthetic freedom and even healing that serious art can provide. Equilibrium to me signifies a balanced, long-term perspective: viability, in effect, in a destabilized environment. 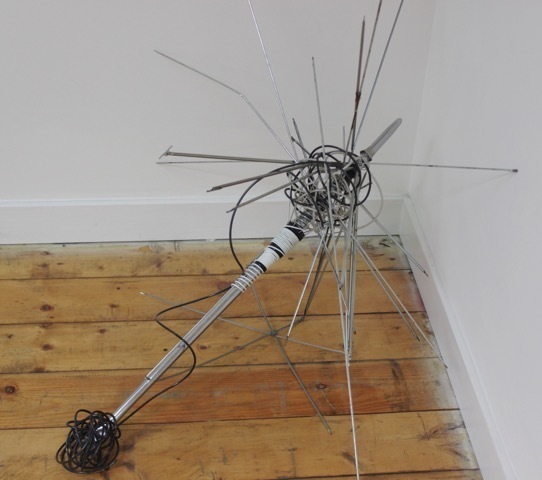 Art is an equilibrating as well as a liberating influence; it is also potentially a Brechtian hammer for shaping reality and a Picassean weapon with which to attack it. The human body was the central focus of western art for some six centuries, from the Renaissance, when anatomical studies began (at some risk to venturesome artists like Leonardo), until the advent of Modernism, when artists rejected academic style and the idea of man as semi-divine. Delacroix’s“admirable poem, that human body from which I am learning to read” had declined into, in essence, debased doggerel. 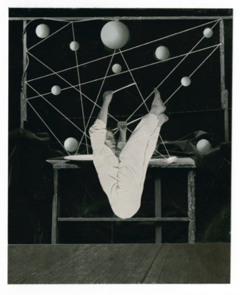 With Dada and Surrealism, artists sought to portray the complexities of modern consciousness, not the dogmas of received wisdom from Greco-Roman and Christian culture. The East Bay painter Lew Carson draws on the Dadaist/Surrealist collage tradition for his poetic imaginary landscapes (or, to use Roberto Matta’s term, ‘inscapes;) Inspired by anatomical diagrams, including the famous 1858 classic text, Gray’s Anatomy (still being published! 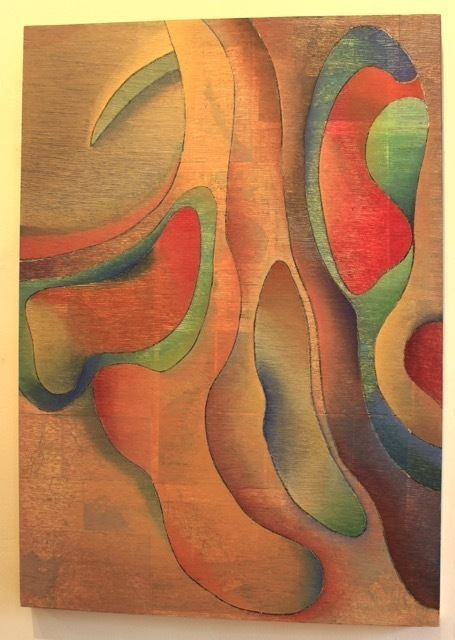 ), which he he found “familiar, complex and mysterious”—Carson layers his anatomical contour drawings atop printed maps mounted to wooden panels. 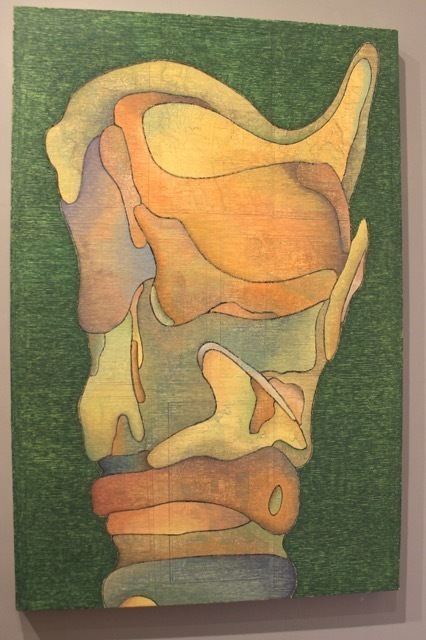 Since the topography remains legible beneath Carson’s translucent glazes, he combines, in Secret Maps of the Body, the inner world and the outer, the self and the world. “Ascension,” “A Narrative of Longing,” “Bone Scape,” “Sequence/Consequence,” and “Luminous Entity” depict the body as a microcosm of the universe. All accounts of mystical experiences note the loss of self and ego—or, rather, their incorporation into the fabric of the cosmos. Carson sees art as a potential vehicle for “transport[ing] us from the ordinary to the ecstatic, a heightened state of clarity and bliss,” and these lyrical semi-abstract paintings, with their glowing, stained-glass palettes and biomorphic forms, show that art can be, despite the aesthetic cynicism of recent years, transcendent, merging the personal with the universal. 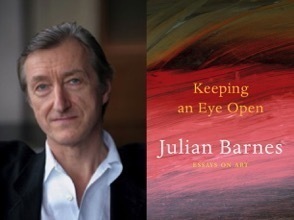 Eyes Only: Julian Barnes' "Keeping an Eye Open: Essays on Art"
I used to read fiction, but in recent years have found nonfiction about art, history and politics more relevant and interesting. Nevertheless, I found the novelist Julian Barnes’ 2015 collection of essays, Keeping an Eye Open: Essays of Art, enthralling, combining a fluent, almost conversational style with thoughtful commentary backed with a fair amount of what Herman Melville called swimming though libraries. Barnes never studied art formally, but clearly did his homework—no Great-Writer vaporizing!—while preparing his “one go” reviews of painters from Géricault to Hodgkin: reading Anita Brookner on Delacroix and Baudelaire; Alex Tanchev on Cézanne; and Redon on Redon, among, undoubtedly, many others. Barnes’ judgments are sound, based on his sympathy with other creative artists, and expressed in a “companionable and untheoretical” (as he declared in an interview with The New Yorker) manner that is both colorful and readable—and sometimes memorably pungent. It is impossible not to provide a few tasty excerpts. ...but why does everyone—even the corpses—look so muscled, so… healthy? Where are the wounds, the scars, the haggardness, the disease? These are men who have drunk their own urine, gnawed the leather from their hats, consumed their own comrades. ... [F]or all its subject matter, Scene of the Shipwreck [the original title] is full of muscle and dynamism. The figures on the raft are like the waves: beneath them, yet also through them, surges the energy of the ocean. ... It is because the figures are sturdy enough to transmit such power that the canvas looses in us deeper, submarinous emotions, can shift us through currents of hope and despair, elation, panic and resignation. ... We don’t just imagine the ferocious miseries ... They become us. .... How hopelessly we signal; how dark the sky; how big the waves. We are all lost at sea, washed between hope and despair, hailing something [the rescue ship Argus, in the distance, which failed to see the raft at first] that may never come to our rescue.